Jessie Brunswig and Kelly Aanenson scored 0.35 masterpoints with a 54.87% game at Bridge On Shea. See full results of this game. Fred Batko and Ken Batko scored 1.64 masterpoints with a 57.31% game at Bridge On Shea. See full results of this game. Harvinder Sidhu and Ben Blacik scored 2.13 masterpoints with a ★62.18%★ game at Bridge On Shea. See full results of this game. Harvinder Sidhu and Ken Batko scored 0.60 masterpoints with a 55.36% game at In Tempo Bridge Club. See full results of this game. Kelly Aanenson and Nancy Johnson scored 0.49 masterpoints with a 47.54% game at Bridge On Shea. See full results of this game. 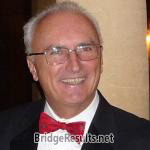 Paul Spear and Judith Meurer scored 0.93 masterpoints with a 57.45% game at Bridge On Shea. See full results of this game. Harvinder Sidhu and Ben Blacik scored 2.96 masterpoints with a 59.13% game at Bridge On Shea. See full results of this game. Ken Batko and Harvinder Sidhu scored 1.13 masterpoints with a 57.78% game at In Tempo Bridge Club. See full results of this game. Kenneth Klein and Kenneth Titow scored 0.84 masterpoints with a 56.67% game at In Tempo Bridge Club. See full results of this game. Markland Jones and Kenneth Klein scored 1.90 masterpoints with a 56.57% game at In Tempo Bridge Club. See full results of this game. Jim Johnsen and Dorn Bishop scored 1.24 masterpoints with a 57.34% game at ACBL Unit 539 - San Diego. See full results of this game. John Urciuoli and Fred Batko scored 1.74 masterpoints with a 56.56% game at Bridge On Shea. See full results of this game. Fred Batko and Sudhakar Divakaruni scored 0.32 masterpoints with a 53.27% game at Bridge On Shea. See full results of this game. Ken Batko and Harvinder Sidhu scored 1.00 masterpoints with a ★62.19%★ game at In Tempo Bridge Club. See full results of this game. Mark Johnson and Kelly Aanenson scored 0.39 masterpoints with a 52.89% game at In Tempo Bridge Club. See full results of this game. Mark Johnson and Kelly Aanenson scored 1.09 masterpoints with a 53.73% game at Bridge On Shea. See full results of this game. Fred Batko and Marianne Spanier scored 0.34 masterpoints with a 54.75% game at Bridge On Shea. See full results of this game. Markland Jones and Kenneth Klein scored 1.90 masterpoints with a 54.81% game at In Tempo Bridge Club. See full results of this game. Kelly Aanenson and Nancy Johnson scored 0.82 masterpoints with a 51.92% game at Bridge On Shea. See full results of this game. Ben Blacik and Harvinder Sidhu scored 0.39 masterpoints with a 52.83% game at Bridge On Shea. See full results of this game. Andy De Leon and Fred Batko scored 0.67 masterpoints with a 58.32% game at Bridge On Shea. See full results of this game. Harvinder Sidhu and Ken Batko scored 1.50 masterpoints with a ★66.07%★ game at In Tempo Bridge Club. See full results of this game. Kenneth Klein and Kenneth Titow scored 1.12 masterpoints with a ★63.69%★ game at In Tempo Bridge Club. See full results of this game. Markland Jones and Kenneth Klein scored 3.00 masterpoints with a ★66.67%★ game at In Tempo Bridge Club. See full results of this game. Andy De Leon and Fred Batko scored 0.60 masterpoints with a 54.17% game at Bridge On Shea. See full results of this game.